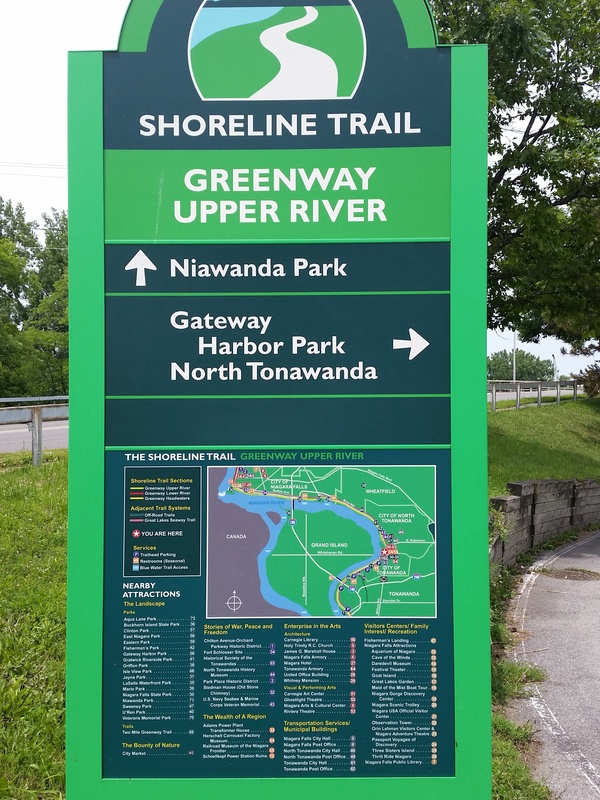 A group of NIMBY (Not In My Backyard) -inspired residents on Grand Island appear to be gaining momentum in their efforts to halt New York State Parks’ plans to convert the virtually unused West River Parkway into a beautiful bike path along miles of the glorious west branch of the world famous Niagara River. These residents, who, to a man and woman, live on West River Road, claim they object to the state’s proposed bike path for various reasons such as safety and the urgent need to keep two parallel roads. West River Parkway and West River Road run parallel to each other and are separated by a grass median. But the Niagara Falls Reporter has uncovered what appears to be the true motive of the loud and critical group. The real reason homeowners on West River Road object to the bike path and what might consequently be the opening up to the public of some eight miles of waterfront along state lands –- is that these same residents are using the lands as their own private parkland! That’s right, the Reporter has discovered that dozens of homeowners on West River Road – the same ones who are objecting – have quietly built docks, patios, picnic areas, camp sites and fire pits on state land – some even added sand for their own private beaches – well hidden behind the brush and foliage that separates West River Parkway from their secret waterfront getaways along the river. The residents of the ritzy homes on West River Road have only to walk a hundred feet across their own hardly trafficked road – then the grass median – then across hardly trafficked West River Parkway to enter into their own private paradise – one virtually never used by outsiders – their tax free, state-owned private waterfront destination. The Reporter also learned there is an unspoken agreement that each homeowner on West River Road uses the state-owned area of waterfront across from their own house – using state land as if it were an extension of their own private property. Some West River Road residents are so territorial that reports have emerged of them threatening visitors with trespassing despite the fact that it is state land and anyone can use it. Naturally the plan to convert the high speed but little utilized West River Parkway to a bike path will make these folks unhappy – taking away exclusive use of their private beaches, fishing docks, and camp sites they built there, since a new bike path will bring new people, and when bikers stop and get off their bikes and wander along the waterfront they will impose their presence upon residents who have previously enjoyed the waterfront all to themselves. People from Grand Island who never experienced the marvelous west branch of the Niagara will hop on bikes and bring picnic lunches and stop and gambol along the waterfront which heretofore has been enjoyed only by a few. Some residents want to keep Grand Island as it is. The state has proposed a bike bath along the west branch of the Niagara River. People from elsewhere may come too – “off-islanders” as some residents provincially describe people who don’t live on Grand Island – to enjoy the spectacular scenery now enjoyed exclusively by a handful of West River Road residents. Until we examined the area ourselves, the Reporter had no idea as to the extent residents on West River Road utilize the state-owned waterfront. Some residents have even placed “Private Property” signs on their buildings and docks on state land as if they would ward off other owners of the land (i.e the public) from realizing it is their property, too. As the pictures show, the high-sounding moralistic and bombastic opponents of the bike path who live on West River Road have a clear motive in so doing. For people on bikes, stopping to rest and picnic is just the beginning. Once the vista is opened up, and becomes known, people will come by car and stay to enjoy the day along the waterfront, swimming and fishing, canoeing and hiking. The wealthy West River Road residents will perforce be sharing parkland with other, plain folk. The well-to-do people on West River Road know full well – what they have all to themselves today may tomorrow be a world class park. And what they know – but will not admit – is that the beginning of the end of their exclusive use of the west branch of the Niagara River starts with the bike path proposal which links Buckhorn Island State Park, at the northern end of the island, to Beaver Island State Park at the southern end, by converting West River Parkway, which runs the entire 8-mile length of the western Grand Island shoreline. The establishment of the bike path will open up an entire new waterfront vista for Grand Island residents, greater Western New York community and tourists from around the world as it becomes better known. In time, it may become a world class park rivaling some of the other notable natural state parks in the area such as Whirlpool, Devil’s Hole, The Old Fort Niagara and Artpark, and serve as a tourist “stay extender” for some of the eight million people who visit the Niagara Falls State Park and promptly leave town right afterward. You have to imagine the vista: eight miles of some of the most beautiful river frontage in the whole world, heretofore almost unexplored and unknown. This kind of waterfront is extremely rare in the world. Such an expansion of unused and gorgeous waterfront in Western New York (the kind of waterfront other cities make fortunes from) will rain on the private parade of West River Road residents now quietly enjoying land they don’t own. Still, the arguments the NIMBY’s use – everything but the truth – to fight the bike path – are preposterous. If West River Rd residents would simply say, “Hey, we want to selfishly enjoy this state-owned land all to ourselves forever – stay away you ‘off-islanders!’” one could respect their honesty. As it is, it’s downright deceptive when they claim they don’t want the bike path because it’s a safety concern or that there is a need for both roads. The truth is West River Parkway and West River Road are redundant, running parallel to each other along the entire distance between the two state parks. The parkway (high speed, limited access) carries a tiny fraction of the traffic it was designed for. It has so little traffic it is not even plowed in winter. Grand Island Councilman Mike Madigan – the leader of the NIMBY voices – declared at a September town board meeting that the project had “taken Islanders by surprise” and led the town board to schedule a “public input meeting” at which residents can speak out in favor of a new, rather insane alternative, the so-called “4th option” to the bike path. Madigan’s whacky “Option 4”, which is gaining support among the homeowners on West River Road, is – if we must have a bike path – because the state is forcing it on us – let’s make it so that nobody will want to use it. Construct the bike path between West River Road and West River Parkway in the middle where the grassy median is now and keep both roads open. “Option 4 does not concentrate/consolidate all traffic on one road increasing risk of accidents,” said Madigan despite the fact that only a couple thousand vehicles a day utilize the West River Parkway, or a little over one per minute. Following Madigan’s assertion to its logical conclusion, we should have two parallel, redundant roads to everywhere, then there’d be no accidents, ever. “(O)ption 4 is in close proximity to residents, greatly increasing likelihood of use by them,” Madigan argues for his NIMBY’s. The argument is preposterous. Who honestly thinks bicyclists prefer to bike between two active roadways in close proximity to the driveways, mailboxes and houses of West River Road, rather than a natural, peaceful bike trail next to the river? The next town meeting is scheduled for 7 p.m. Thursday, Oct. 6, at the Grand Island High School, 1100 Ransom Road in the main auditorium. Expect a cadre of NIMBY homeowners on West River Road to tell everything but the truth – which is that they secretly use the land they don’t want anybody else to use. Bet you thought this was private property? Well it is not. This is state-owned land along the west branch of the Niagara River which residents of West River Road have quietly usurped as their own private waterfront retreats. From talking to island residents this is the problem. They think they are better than TOT and don’t want anyone from “off the island” to be near their house. There is a lot of racism and snobbery. as safety and the urgent need to keep two parallel roads. The people protesting are all people who own property adjacent to the land and claim they object due to safety concerns and the need to have two parallel roads. Yes, I got that. I was referring to the “to a man and woman” comment. It would serve West River residents right if the state built a huge sound-dampening wall between the homeowners and the proposed park. For safety reasons. They don’t own the waterfront no matter how many silly lawn signs they put out or how much they demonize the supervisor to make it so. The fact is they are throwing a temper tantrum fueled by political agenda, xenophobia, and snobbery. You’d think they were suffering a great injustice by the drama they are dusting up, its a bike path people.